There’s no denying Hong Kong is a town devoted to luxury – lavish label advertisements line the streets and fashion brands fill up high-end shopping malls all over town. Something similar can be said about food. Expensive ingredients like iberico pork and edible gold, stuff city menus. Is this too much of a good thing? Last year, London restaurant Honky Tonk came up with the Glamburger. Retailing at £1,100 ($13,350) the dish includes Beluga caviar, grated white truffle, lobster and Kobe wagyu beef, all encased in a gold leaf-trimmed bun. Extravagant? Yes. Appetising? Not so much. When we open Tycoon Tann’s menu, there are opulent ingredients such as foie gras, garoupa and truffle dotted everywhere. Combined with the contemporary art decorating the walls and a small dining room that only seats about 35 people, it seems like exclusivity is the name of the game. Pondering whether the pricey food products are necessary requirements or lavish superfluities, we tuck in to find out. We begin with some Chinese barbecue items. First up are the Hungarian mangalica hogs with honey sauce, aka char siu ($288). The dish arrives on a hot plate with a tea light keeping the pork warm, which proves a fine way to present the dish. Mangalica pork is known for its marbling, and though the texture is more stringent than that of iberico, the heat from the plate melts the fat and tenderises the meat, allowing the fragrant flesh to permeate on the palate. 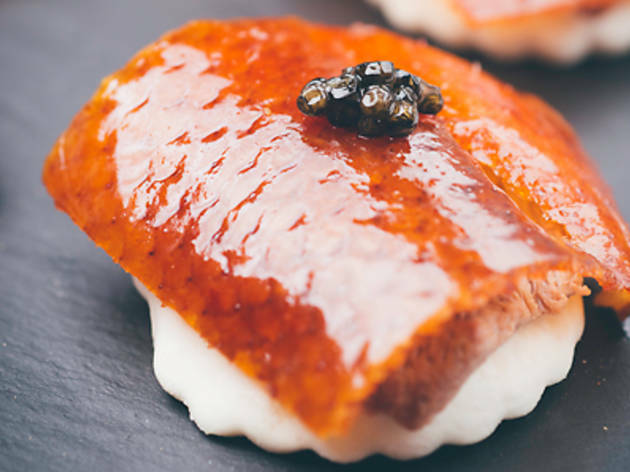 Next arrives the Peking duck with caviar ($468), where a precious six slices of the bird are served on top of bite-sized pancakes with only the caviar as condiment (as opposed to the usual plum sauce and spring onion). The salty contrast of the caviar between the crackly skin and sweet pancake is harmonising, but the pairing teeters on the edge of using an expensive garnish for the sake of it. However, the umami flavours of the fish roe rears us back to appreciate the meat flavours longer on the palate. For mains, we plump for chicken wings stuffed with black truffles, pearl barley, Yunnan ham and foie gras ($276). It sounds like a mouthful, and based on the previous item we await this dish with trepidation. First impressions are good: the wings arrive crisp and golden and the fragrance of black truffle is strong. Unfortunately, all the heavy flavours on the tongue melt into an indiscernible rich medley. It’s not bad per se, especially with the chewy texture of the barley, but we can’t help but wonder whether the wings would be more memorable if only a single ingredient was dominant. Next up, we choose the steamed winter melon box with wild fungus and mushrooms ($188). Shaped like a basket, the porous melon is steamed with an array of mushrooms and Yunnan ham, where it absorbs the aromas of all its contents, leaving the vegetable packed with flavour. We particularly appreciate the use of golden tremell in the mix of fungi, as its herbal notes add a floral element to the savoury taste of the dish. This shows the attention to detail on the chef’s part and abates our doubts over whether there’s an excess of fancy ingredients at Tycoon Tann. Any lingering apprehension is blown away by the signature fried rice ($328). Plated with pretty sprinklings of dried sakura ebi (Japanese dried shrimp), the rice is a blend of crab meat, Yunnan ham (a favourite here) and conpoy, with a braised abalone perched on top. The seafood flavours complement one another wonderfully and the addition of crispy rice piques our interest with every bite. The jewel of the dish, the abalone, provides a satisfying bite of protein. Another winner. We round things off with a silky almond cream and egg white ($68), which ends the meal on a sweet note. Tycoon Tann 74 Wellington St, Central, 3125 3228; tycoontann.com.